Do You Experience Work From Home Guilt? You're Not Alone. It's possible to work through it. Are you a remote employee who has ever chastised yourself for not getting dressed up in the mornings? Or, have you found yourself overexplaining how productive you were during the week? If so, there’s a chance that you have work from home (WFH) guilt. Although it may sound silly, WFH guilt is a real thing. It’s that slightly shameful feeling you get as a result of having a flexible job. For the past few years, I’ve built my career from the comfort of my own home, so I know it well. I deliver quality career services to clients I really enjoy working with but sometimes I feel a tinge of guilt about doing it from home. Truthfully, remote work has come a long way. Just a few short years ago, working parents, frequent travelers, and digital nomads were fighting for more flexibility in their work. 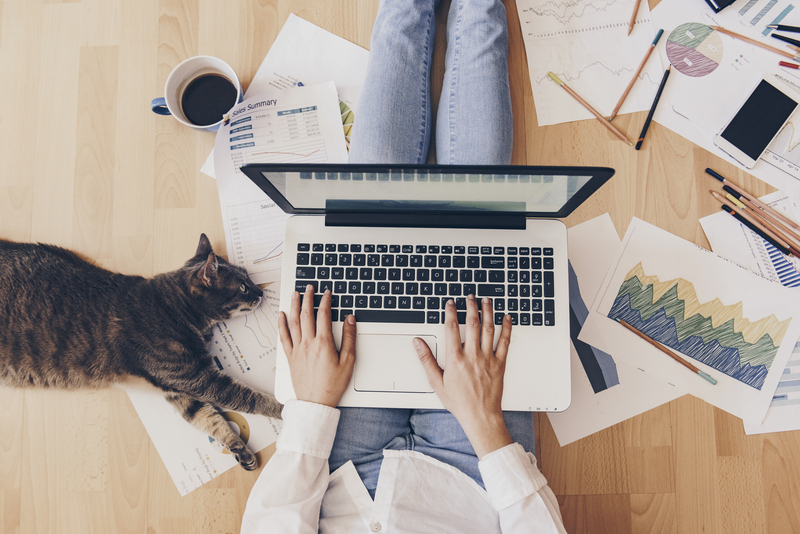 While some employees are still fighting for at least one remote work day per week, others have figured out how to do what they love without ever leaving home. So, whether you work remotely all of the time, some of the time, or none of the time (and are working toward it), you can overcome your WFH guilt in 3 simple steps. One of the most common stigmas of remote employees is that they are chillin’ on the clock. Interestingly enough, when I was an in-house employee, I was never accused of relaxing on company time. Getting up and commuting to work was enough to “convince” people that I was a busy (and thus, productive) member of the workforce. When I started working from home, people started asking questions like, “Do you take naps during the day?” (I do), “Do you work in your pajamas?” (I absolutely do), and “Do you work normal hours?” (I do…if you consider 12-hour days normal). Remote work still rivals our definition of “regular work”. Luckily, if you meet work deadlines, fulfill team goals, and remain responsive during work hours, you are just as productive as an in-house employee. Have no fear, the data is on your side! The remote worker population has grown by more than 11% since 2008. So, if you’re working from home, you’re in good company. Not to mention, fewer commuters on the road leads to decreased air pollution and less road traffic. You also boast increased employee engagement and higher efficiency. What’s more, in 2014, PGI concluded that 82% of remote workers reported low stress as a result of greater work flexibility. Employees with greater satisfaction, engagement, and efficiency are a win for the manager, the company, and even the environment. Although you may feel a bit self-indulgent while working from home, remember that the stats are in your favor. As long as you are making positive use of your work time, you can go about your day guilt-free. Remote workers tend to have fewer distractions than in-house employees, resulting in faster turnaround times. If you finish a project early, fight the urge to run errands or binge-watch Netflix. Instead, get a jumpstart on the next project. Clear your inbox, update your calendar, or check in with your team members to see if you can assist them. Don’t feel pressured to work through your lunch break just because you’re at home – take breaks as needed. Head to your local coffee shop, bookstore, or shared workspace when you need a change of scenery. Making the most of your workday will help you feel less guilty and more energized toward your work. Ultimately, your WFH guilt is tied to what people think you’re doing versus what you’re actually doing. Co-workers, managers, and even family and friends may have the wrong idea about your workday, but you don’t have to feel guilty about their perceptions of remote work. Your job is to be a hard-working team member that adheres to company policies and best practices just like anyone else. After all, you were entrusted with a remote work assignment because you can get the job done from home, the office, or anywhere in between. So, log in on time, put your feet up, and get to work!